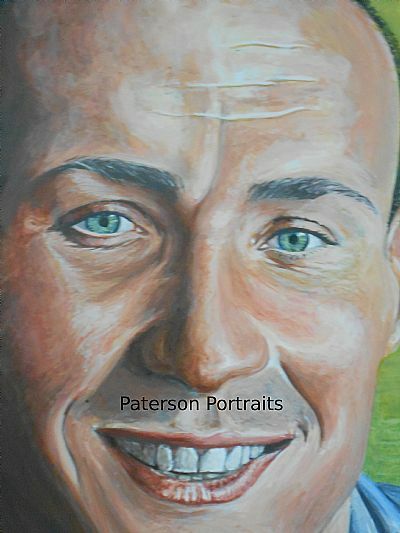 Comission a portrait from your own photo or arrange a life sitting by contacting us via email david@patersonportraits.com with your requirements or use the contact form here. Each portrait is different and a price can only be set when your requirements are defined and agreed. A photo or photos of the subject(s). Your home town and country. The medium, size and number of subjects in your portrait. ie. you may want to put two people together from different photos or have someone posing with a family pet. Tell us about any special specifications you may have, eg. combining two or more photos into one painting. Indicate if you wish to collect in person or require delivery. Once we have agreed details you will recieve a price including P&P and on receipt of a 30% deposit work will commence on your portrait. You can cancel your order for any reason within 28 days and receive a full refund of your deposit. After 28 days you will not be elligible for a cancellation refund as work will have commenced on your portrait. Regular progress photos will be emailed to you giving you the opportunity to request changes which will be implemented if possible. Please note that changes are easier to make during the early stages of painting and only at the earliest stages of drawing for graphite portraits. On your approval of the finished work and payment of your balance, your portrait will be delivered to you by signed for and insured parcel delivery. Alternatively you can arrange to collect your portrait if practicle, please state your preference as you will not be charged postage if you collect in person. All images are copyright David Paterson all rights reserved.